There are plenty of occupational therapy jobs out there, but the challenge is knowing which one is right for you. And then there's the added task of actually landing that dream job. 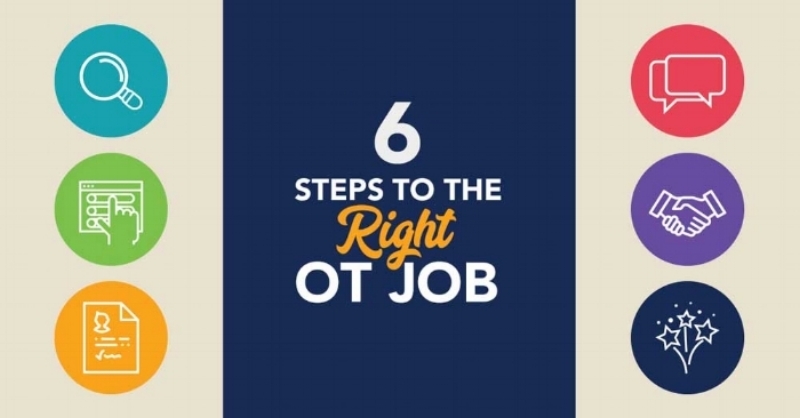 Luckily, we've created a foolproof six-step list to help you find the perfect OT job, and make it yours! 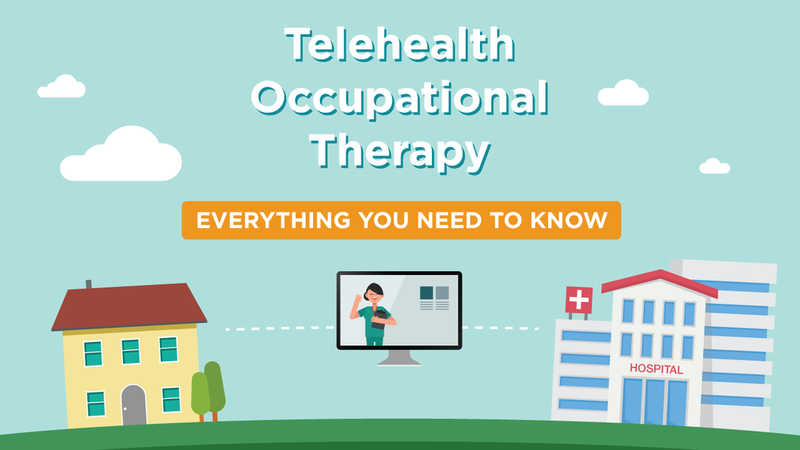 Step one of this guide walks you through your OT job search options, and also provides specific guidance on searching for non-clinical jobs, travel therapy positions, and telehealth options. Spend a few minutes breezing through all of the job boards to see what options are readily available to you. A ZipRecruiter job board is embedded below, followed by a comprehensive list of your other job search options. Many jobs are cross-posted on different boards, but it is still worth it to pull up each of these sites and search for jobs that are readily available in your area. Relode: A Healthcare Crowdsourcing Start-up. I believe that crowd-sourcing is the future of job hunting. Through Relode, you make an account and then track available jobs in your area. You can either apply to the job yourself or refer a friend, and in some cases, your referral will earn you some bonus cash. The Occupational Therapy Job Seekers Facebook Group. I started this group in conjunction with this page as a place for people to post jobs and ask job-hunting questions. It has been growing quickly, and I am proud to say that several people have already successfully found jobs through it! Traveling OT is a different ballgame. Instead of looking for the right position, you are looking for the right company (and recruiter!) to work with. If you are just starting to consider traveling, check out my interview with Emily Butler, OTD about life as a traveling occupational therapist for an overview of what traveling entails. My other go-to source for OT travel information is the Travel Therapists Facebook Group. This is an extremely active and supportive community. Here are some of the travel companies I see mentioned regularly. Just let Nomadicare do all of the vetting for you! We are extremely lucky as occupational therapists to have one of our own, Laura Latimer, OTR/L, working tirelessly to advocate for travelers in the travel industry. Her company, Nomadicare, vets recruiters through a 3 hour interview process then connects therapists with recruiters who match their needs. Laura Latimer, OTR/L founded the website, Nomadicare. If you aren't finding any local clinical jobs, then consider going back through the job boards and looking for these non-traditional jobs. Here are a few examples of roles that are ideal for OTs. Some of the above jobs might look familiar to you, while others do not. Similarly, some (think Case Manager and Diabetes Educator) require additional education or training to qualify for the roles. Looking for more help with finding non-traditional jobs? Check out my post, Your Guide to Non-Traditional OT Jobs. You can also browse The Non-Clinical PT, a website devoted to helping rehabilitation professionals transition out of patient care, and into non-traditional roles. There are tons of helpful free resources and articles on the site, and members (membership is free) can connect directly with each other to network and share ideas. If you're looking for non-clinical jobs and nothing else, you can also join the free Facebook Group Non-Clinical Job Postings for Rehab Professionals. There are parts of our country where OT jobs are simply hard to come by. And not all of us have the option of packing up our lives to travel. If this is you, do not despair. Another avenue you can pursue is teletherapy (also called telehealth). You can either serve clients in remote portions of your state, or apply for a license in a state where there is a need. You need to be licensed where you live and where you are providing therapy. You may also need to have experience in pediatrics, though adult teletherapy is on the rise. After finding job openings, don't apply willy-nilly. Be Choosy. Hopefully, after exploring these options for finding jobs, you've found a few roles that pique your interest. You may be tempted to apply for these jobs without looking back. Steps two through six are filled with information to ensure you're targeting trustworthy employers, and that your application materials will showcase you as the stellar candidate you are! Plus, you'll find tons of helpful hints to help you shine during your interview, and land a salary that reflects your value. Not all rehab companies are created equal, and some companies have turnover rates that would make your hair stand on end! Before applying for occupational therapy jobs, take time to research the companies you are interested in. You do not want to be surprised by unrealistic productivity levels or an unhealthy culture. You want to find a company with a culture that values you as an individual and puts clients first. Glassdoor is a great place to start your research. Glassdoor is a site where employees can leave anonymous company reviews. I've also noticed people are willing to share their experience with companies on related Facebook groups. If you are looking at multiple companies, consider making a spreadsheet of the different benefits each one offers. You may not be able to find all of the information in the initial listing, but you can add to your spreadsheet as you progress through the job hunting process. This image gives you an idea of what a spreadsheet could look like when researching travel companies. After honing in on that dream position that suits your needs (and ensuring the company culture resonates with your values), it is time to apply. If your resume needs some work, this blog post on How to Make Your OT Resume Stand Out gives some general pointers. I'm also on the hunt for a great healthcare resume writer, and I've got some good leads, so stay tuned! 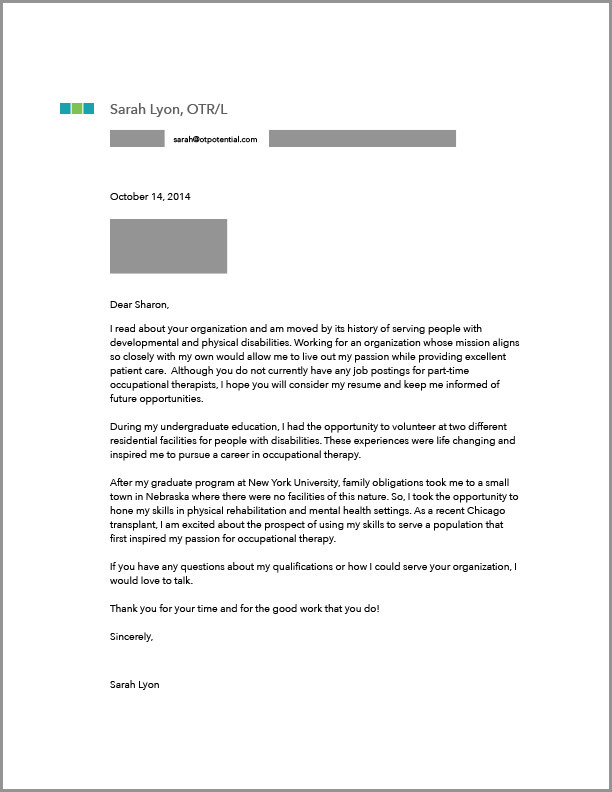 Below is an example of my occupational therapy resume, a sample OT cover letter, and a reference list that you can use for inspiration. Most applications will be online. I strongly recommend that you print out a finished version, and save it for your reference. The info may come in handy when filling out future applications. This is always the most nerve-racking part for me. If you need some help prepping for your own interview, check out Nail Your Occupational Therapy Job Interview. Please keep in mind that the interview is also your chance to ask questions. Below are some questions that were suggested in interviews I conducted. If, after reading, you still have questions about interviewing for positions in specific practice areas, practice area-specific Facebook groups are a great place to ask! If you need help finding the right one, ask me in the comments below. I think I belong to every OT Facebook group known to mankind. These are derived from my interview with the pictured acute care team. Is there organizational-funded continuing education? How many major/minor holidays do you require? Do you offer an incentive or time and a half for working holidays? These were suggested in my interview with Mandy Chamberlain. Is the company providing OT services for an internal or an external company? What vacation time is offered? Do you encourage program development? What are your work hours and what happens if your census is low as a full-time employee? What type of documentation system do you use? Are you involved in care conferences with the patients and families? What is the percentage of long-term care residents versus short term rehab? What are the daily productivity standards? Is it possible to have a lower standard for the first few weeks until familiar with the job? These were suggested in my interview with Monika Lukasiewicz. What are at least two qualities that are important to make a team member successful in this company as a home health OT? How many patients will I be expected to treat each day? Approximately how much mileage will I be expected to drive each week/day? What would it look like for an OT to be successful in this position? Please describe what it would look like from a management or team perspective. Why did past OTs leave this company? Please describe the documentation system/process for an average day (or at least for an average visit and an evaluation). Where would you hope to see the OT department of this company/team be in five years? What, if any, areas of expertise are either already present on the team or are wanted on the team (i.e. lymphedema, cognition, vision, neuro, ortho, motivational interviewing)? These are derived from my interview with Emily Butler. Medical coverage: Is this free for every placement? Also, how does medical coverage work between placements? For example, if I want to take off a week between placements, would I still have medical coverage? Is there a meals and incidentals stipend? These were suggested by Lauren Jones of the blog Gotta Be OT. What is the age range of students I will be serving? What is the radius I will be expected to cover? Is there reimbursement for mileage? What will I have to pay for out of pocket? How many therapists are employed by Example County Schools? How can I consult or connect with other therapists in Example County Schools? How many special education cases in Example County Schools have gone to due process within the past year? What is the minimum number of shifts/month required to maintain PRN status? Who will be available for me to contact if I have a question while filling in for someone? How will I be brought up to speed on my caseload before seeing patients? What are the productivity standards for PRN staff? What training will be required throughout the year to maintain my PRN status? How will I be updated of changes in the department's policies and procedures? OK, never mind, THIS can be the most nerve-racking part. I've lost nights of sleep worrying about negotiating a fair and mutually beneficial contract. You will be happier with a contract in which you helped to set the parameters. You will quickly learn invaluable information about how the company treats employees. Your skillset is worth it! Below is one example of a successful negotiation. If you have a success story, I would love to hear it in the comments! A good salary negotiation is founded in research. Gather as much information as you can about comparable positions. Factors to consider are practice area, geography, and your years of experience. This is why I love OTs. Kate Washa Boyd is an OT who wasn't satisfied with the OT salary information she was finding, so she created her own survey and website, OTsalary.com. This website is a standout because you can sort by years of experience, job type, state, education level, etc. The best way to use it is to download the information so you can sort it yourself! Click on the button below to add your own info to the spreadsheet! PayScale gives lower median annual salaries for full-time OT practitioners, but the salaries are calculated based on respondents to a PayScale survey, which I assume is a smaller pool. What is helpful on this page is an overview of salaries from some of the big employers like Rehab Care, Aegis, Fox Rehab, etc. I found the StoryBrand Podcast Episode #26 - 5 Strategies That Will Make You a Strong Negotiator extremely helpful in normalizing the act of negotiation. I also give more details about my own negotiating experiences in my post, Occupational Therapy Job Negotiations. Finding the right OT job is just the beginning to providing great care. And landing a job you are excited about is certainly worth taking time to celebrate! If this page was helpful to you, please consider sharing an Instagram post on your first day on the job with the tag #newOTjob or tagging me at @otpotential! Arriving early allows you to have time to use the bathroom, make pleasant chitchat with the support staff, and fill out any last-minute paperwork. It's a good idea to arrive 15 minutes early; any earlier, and you might inconvenience people trying to get their days started, and any later might not allow enough time for a bathroom run or other tasks. Print out two routes to your new workplace the night beforehand. Sure, GPS can do that whole "recalculating" thing, but the last thing you need on your first day is to be buzzing around unfamiliar on-ramps and off-ramps, negotiating construction sites, or stuck in traffic jams. Print out those two routes, and you'll be thankful when Murphy's Law kicks in! Set your alarm early, and set a backup alarm. Whatever time you think you'll need, set your alarm 15 minutes earlier. The extra time (and that backup alarm) will help ensure you get up and moving with plenty of breathing room. Plan your breakfast in advance. Cook that oatmeal the night before, or pre-cut the fruit for your yogurt. You'll save valuable time in the morning, and you won't be tempted to skip that much-needed breakfast if you're scrambling to get out the door. Bring a (very small) token of appreciation on your first day. There's a fine line between appreciation and sucking up and, if you can identify that line, you'll be golden. For example, did your manager mention that the team enjoys having a cup of coffee together every morning before the day starts? Consider bringing in a bag of pre-ground coffee with a short-but-sweet note about how excited you are to get started. Skip bringing in the $75 coffee pot with the auto-settings; that's overkill! Review critical information you'll be using on the job. Will you be working in acute care? Review critical lab values, exercise contraindications, and other pertinent information. Inpatient rehab? Refresh yourself on FIM scores. Consider printing out forms and templates that might make your job easier on the first day, and make you look extra prepared! While no workplace should expect you to work on your lunch break, you might find that you only have 25 minutes to pick a lunch and eat it. And you might find that the hospital cafeteria or nearby sandwich shop don't contain food you like, or the lines are too long. Packing your own lunch ensures you'll eat something you enjoy and know will make you feel good throughout the day. Again, congratulations on landing your OT dream job! I wish you the best of luck with your next steps!